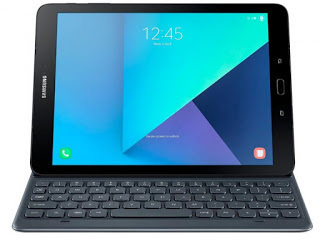 Samsung today Launched Galaxy Tab S3 in India which was announced at MWC. It has a 9.7-inch Super AMOLED QXGA display powered by a quad-core Snapdragon 820 SoC with 4GB RAM and 32GB of internal storage expandable with MicroSD card. It runs on Android 7.0 (Nougat). It has quad stereo speakers tuned by AKG by HARMAN and comes with an enhanced S Pen.There is a book cover and a keyboard cover. Both are connected via the magnetic connector on the bottom of the tablet.The keyboard has a 1.5 mm stroke (key travel), and the keyboard pitch (distance between two keys) has also been enlarged for better typing.